I don't know if it was Ellie over at Almost Bourdain or Little Teachow at The Little Teachow who inspired me, but I like the idea of revisiting some of the early recipes I put up on the blog. 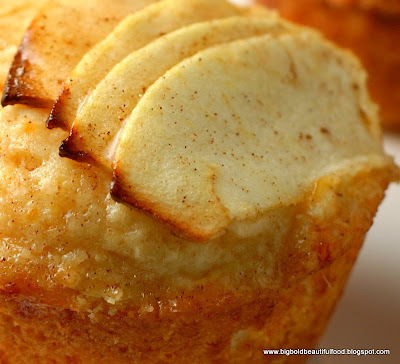 These mind-blowing Dutch Apple Muffins were one of my first posts. My in-laws were visiting, and I remember thinking that now I had a blog I should try to make something out of the many magazines and cookbooks I had on my shelves but never cooked from. We were oohing and aahing over the muffins, and I was excited to share them here. I just made them again today, this time for my daughter and her friends who slept over for Halloween. Definitely not worthy of food blog galleries like Tastespotting and Foodgawker. Aggie of Aggie's Kitchen, my first food blog friend and mentor, told me about these sites, and I was in awe of not only the great food but the terrific photography that made you want to dive right into the pictures, fork in hand. After a lot of rejection, my Filipino chicken adobo picture was approved by Tastespotting. My first picture! I was walking on air the whole next day. To any of my fellow food bloggers, does this sound familiar? It seems a little silly, but I'm still happy when my submissions get accepted. Unlike the photos of my more talented blogger friends, my pictures still get rejected for over- or under-exposure, unflattering composition, or blurriness. That's okay. I can always try again. I hope you will try these muffins. They are OMG delicious! These muffins are from Cook's Country Magazine, my favorite cooking magazine. Contributed by a reader, Donna Bardocz of Howell, MI, this recipe won the grand prize for the magazine's muffin contest. They will knock your socks off. A little sweet, savory, and tart, these muffins are perfect to serve or bring to brunch. 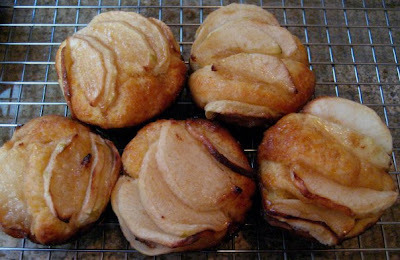 The thinly sliced apples and the glaze which caramelizes on top during the last few minutes of cooking are what take these muffins over the top. Heat oven to 375 degrees. Spray non-stick muffin tins (12 muffins worth) with Pam. Whisk egg and milk in the measuring cup. In food processor, pulse flour, sugar, baking powder, cold butter, salt, and cheese until it resembles coarse meal. Pour in liquid and pulse until just combined. Spoon batter evenly into muffin tins. Core and peel apples, slicing thinly (use a mandoline if you want it uniform). Arrange apples in fan pattern on top, pressing down slightly. Bake 15 minutes, until edges are golden. While muffins are baking, heat together glaze ingredients until the sugar dissolves. When the muffins have finished their 15 minutes, generously brush muffins with the glaze. Let cook another 10 minutes or until an inserted toothpick comes out clean. Cool for a few minutes and then transfer to a rack to cool a few more minutes. Enjoy. we were in the same boat as you.. we should have been called "rejection couple", but just like everything in life, gotta keep plugging away and trying. I doubt these pix will be rejected...looks fantastic! Congrats! Gorgeous photo of gorgeous muffins. I haven't been submitting photos because I don't want to deal with rejection! You have become a wonderful food blogger photographer!! So much so I want to make these:) And I will.. It's a lovely gift when a submitted photo is accepted:) It's a wonderful way to share recipes,anecdotes,lives. I so enjoy all of this. Those muffins are awesome. Thanks for your special mention and I feel touched by your kindness. I got rejected a lot by the two sites in my early days of blogging too. It drove me crazy. I have never been rejected so much in my life. lol!! I still get rejected! Haha! But seriously, these muffins are beautiful. Golden and just plain pretty. So cute and tasty - perfect for this time of year. Great idea redoing old posts. I have a bunch of recipes that were really good but were shot under less than flattering conditions. These muffins look fantastic! Such a great idea to re-visit old recipes! I will have to do it more often. I can relate about old pictures in my blog - sometimes I feel like deleting them but it just shows how far I've gone and plus it makes me excited to think what the future will bring! We go back and redo old posts every so often. Definitely a good way to "redeem" a post with better pictures. Yours look lovely! Delicious! I love the flavours in this - it looks fantastic =D. I completely agree about the food sites - on rare occasions where I get accepted, its pure bliss! Congrats by the way! Fantastic looking muffins! I'm so glad to hear someone address rejection issues with TS, I've yet to be accepted and was beginning to think it's just me. I'll keep plugging away and submitting and maybe one day I'll be on cloud nine too! I couldn't agree with you more! I have been rejected also but when you finally get a picture up on the site it is an amazing feeling! As a Dutchman I wonder why these are called "Dutch muffins" any idea? Great job on the muffins and the photos! 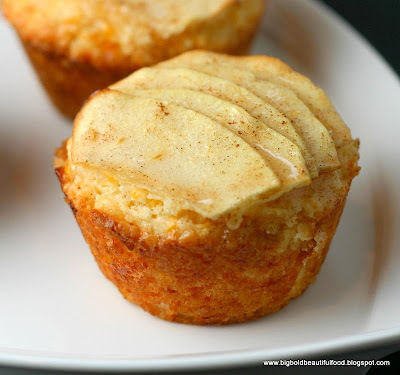 They look pretty darn amazing, especially the apple/cheddar combo... yum! hey there, i on the other hand must be cringing if my beginner food photos are to be compared with the other food blogs out there.. I just started with adding recipes at mine,but oh god i dont think i can bother competing w any other beautiful pics out there. Oh well,i still think that there's beauty in imperfection,i've got a lomg way to go in food photography! But anyway,i feel like making these muffins this weekend! Those muffins look so yummy. I must try them. Mr.B, being Dutch and loving any dessert with apple is sure to love this! I know exactly what you mean about having photos accepted and rejected. These look delicious! My husband would love them. Brilliant photos! Aww..these are gorgeous...the sliced apples on the top make it special. oh yes I hold my breath when I submit a photo to FG or TS...and when I do get accepted I keep looking at my fotos over n over again LOL....mine always get rejected for 'lighting issues' or 'dull'. :( There was a time when I gave up submitting for some months out of frustration. But never give up is what they say. :))so it helps me improve somewhat. Oh my gosh these look great! Loved your comments on tastespotting and foodgawker rejection too. Sometimes I get so frustrated when I think I have a photo that is "worthy" and then it gets rejected. But I suppose being rejected is what makes being approved feel so damn good. Those muffins are awesome. I will have these baked someday. Thank you for posting on your quest to get your food posted on foodgawker and tastespotting. I've been having the same problem, and it's nice to know I'm not alone. Hopefully I'll make it up there like you did!